The artwork of past owner Beth McCormick includes feather work, sculpture, painting and ceramics. She credits her long history with The Onion House for inspiring her vision. Kendrick Bangs Kellogg, the architect whose vision and toil created the Onion House, says that the children who have grown up in his unique living spaces have become artists. Although I didn’t exactly grow up in the Onion House, it has breathed creativity into my spirit throughout my life. At 5 years old, I was the only ‘sympathetic ear’ willing to share in my aunt’s enthusiasm for the project, when everyone else seemed to think she was daft. I spent the summer at 10, visiting again at 13, and moved to Kona at 20. At 30, challenging circumstances gave me the opportunity to purchase the place, in its sadly run-down state. With the eyes of love, I looked past the immense amount of work that needed to be done, to admire the beautiful bones of the structure itself. I was already a studio craftsman, earning my living with my work, by the time I purchased the Onion House in 1984. I ‘set up shop’ producing my line of wearable feather pieces in the small bedroom looking out toward the lily pond. Everywhere my eyes landed needed attention, and steady concentration on the intricacies of my craft offered a sort of respite from the chaos. Rehabilitating the Onion House was a bit like water dripping on stone, steadily carving away the debris, revealing a marvelous sculptured Grand Canyon. Gradually, my surroundings began to shine, and my artwork grew slowly alongside the restoration project. The brilliant color and sheen of feathers always attracted me, but I realized they were not particularly highly valued in my own culture. I began to study tribal feathered ceremonial objects, including the magnificent Hawaiian cloaks, helmets, and god images. These museum artifacts, the products of intense concentration, focus, and creativity, had a timeless value. It dawned on me that very few contemporary artists were taking up this ancient, venerable craft. ‘Fresh turf’ is what artists yearn for. I felt the work calling to me. Somehow the boldness of my surroundings at the Onion House inspired me to take chances, to invest enormous amounts of time, pouring myself into my artwork. My repertoire began to expand. The stone terrace and slanting lava walls of the Onion House reminded me of the sacred Hawaiian heiau, temple platforms made of lava rock. With a completely fresh take on this ancient building style, incorporating contemporary materials, the architect looked to the native Hawaiian culture for inspiration. I began to see that I too could find my own artistic voice, and develop a body of work unlike any other, while drawing on these indigenous art forms. All the while, the space where I worked was lit up with color from James Hubbell’s fanciful stained glass windows. That sense of playfulness found its way into my work, and I began to take more chances, extending my reach. I realized that my palette of feathers was far more extensive than my predecessors, the tribal feather artists. My 40-year feather collection contained plumes from birds native to the Himalayas, the Amazon, Australia, and Eurasia, as globalization affected even this time-honored craft. Working with feathers made me consider birds in a more familial way, and for years I had a pet cockatiel and a parakeet that sat on my shoulder, keeping me company while I worked on my feather art. I saved feathers from my pet birds, and traded for other molted feathers from parrots, macaws, and Australian rosellas. I began to favor the feathers obtained this way, painstakingly, from hand-raised domestic pet birds. As featherwork connected me more closely to the natural world, I found myself being called to change the focus of my life's purpose toward creating a sustainable way of life, or Permaculture. Ecological issues began to be more pressing to me on an emotional level, and I wanted to learn to grow my own food. On an enchanted piece of jungle across from the ocean on the windward side, in a remote area of the Big Island, I helped to pitch a tent and begin to clear the land. Inspired by the principles of Permaculture and 'The Pattern Language,' I worked for the past fifteen years helping to establish a small off-grid homestead and orchard. 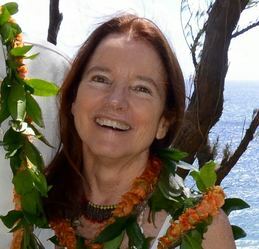 I co-founded the Permaculture Foundation of Hawaii, which works in its own small way toward preservation of the natural world. This direction toward Permaculture created changes that rippled throughout my life, including opening up the Onion House for others to experience their own transformations. I felt myself steered toward the painted image. Creating the farm helped me to experience viscerally, rather than knowing intellectually, that I am part of nature, and nature is intimately the whole of me. 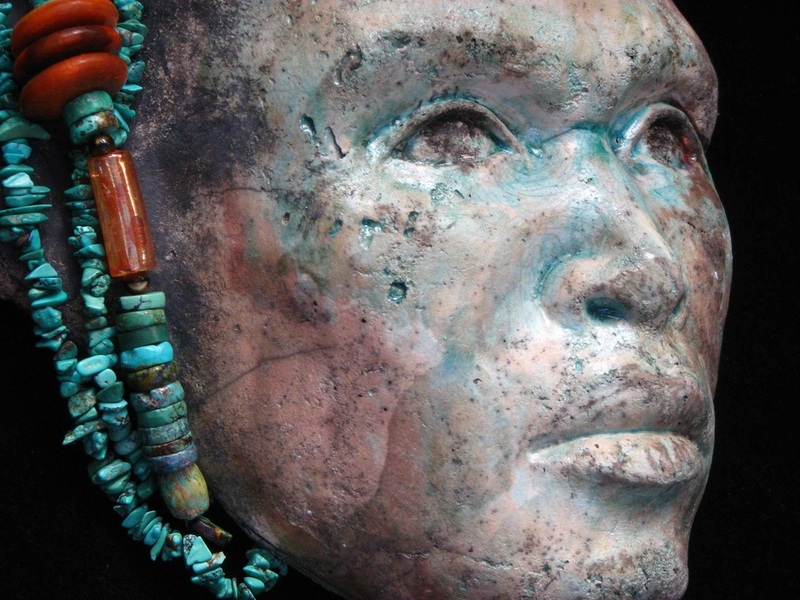 Largely self-taught, my artwork has spanned a wide variety of media, including ceramic, bronze, and fiber sculpture, silk dying, featherwork, printmaking, pastels, and oil painting. At various times, I've sold my work in over 90 different galleries across the US and abroad. It is housed in many private collections, including the Michael Rosenberg Collection in London, and the Chris Hemmeter Collection in Hawaii. The Onion House seemed to embody the sense of the possible, and it nourished the creative impulse in me. For many years my art was a means of livelihood and a source of personal identity, but I gradually realized it was much more than that. I'm drawn to the therapeutic power that working with my hands has offered throughout my life. I'm convinced that much-needed healing in the world could come about for many people through immersion in the process of art-making, as it has done for me, and as our species has innately done for all of recorded history. My hope is for creative rejuvenation to be shared with others through the Onion House. "Feather Art by Beth McCormick" -Courtesy of Big Island television, Lyman Medeiros narrating, filmed in 1995. Set at the Onion House, and at a solo show of featherwork at the Gallery of Great Things in Waimea. 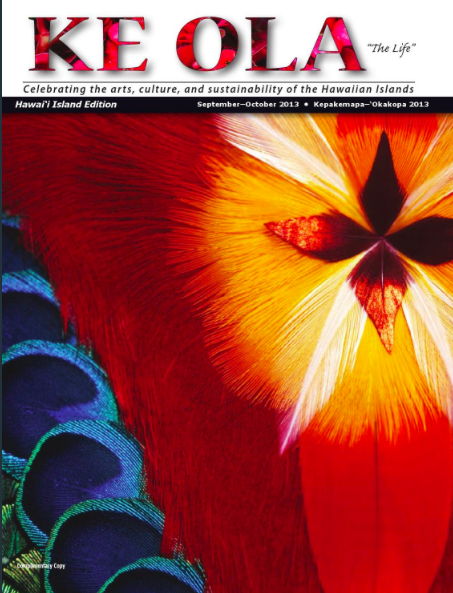 Sept- Oct 2013 issue of Ke Ola Magazine featured Feather Art by Beth McCormick, as well as the story of the Onion House.